Is this really true, well yes to a point and if not it is still a classic and funny t-shirt to throw on and go out in. 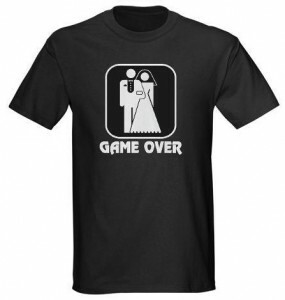 This Wedding: Game Over t-shirt features a husband and wife who have just wed standing side by side with Game Over under neath them. This is definetly a classic, and it comes in so many sizes you will find the right one for you. Made from 100% pre-shrunk cotton. Get your Wedding Game Over T-Shirt.